I love playing with herbs and spices in my cooking, so when I first went on the paleo autoimmune protocol (AIP) and had to eliminate both nightshades and seed-based spices from my diet, I thought I would simply die of food boredom! 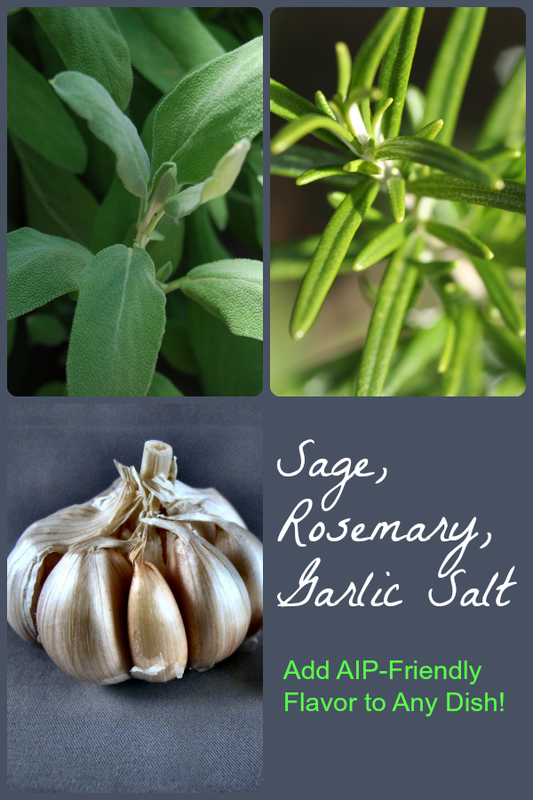 What saved me is this sage, rosemary and garlic salt – which I actually created as a way to preserve and use an unusually large herb harvest several years ago. It was just by chance that I later discovered that it was AIP-friendly and became a staple in my cooking during the elimination phase of my AIP experience. 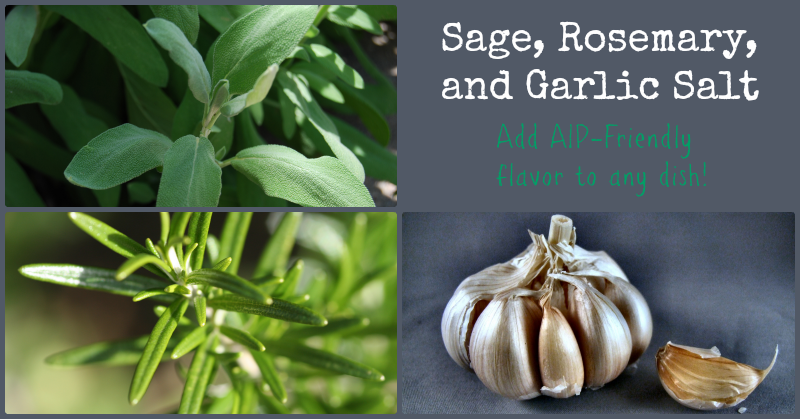 Keep that in mind when you make your own… You can make a bigger or smaller batch, you can substitute other herbs, ramp up or down the amount of garlic… whatever suits your fancy! The directions below are just a blueprint, and even though I’ve provided some measurements, please take them with a grain of sage-rosemary-garlic-salt! This recipe is both AIP and SCD compliant. No modifications necessary. Garlic is a notoriously high FODMAP food, so omit it and just make a sage-rosemary salt if you are on a low-FODMAP diet. You can use any coarse salt, including regular kosher salt from the grocery store, but I recommend using a quality unrefined sea salt like Redmond Real Salt (available from Barefoot Provisions), Celtic Sea Salt , or Himalayan Pink Salt. This simple herb rub combines fresh herbs and garlic to make a delicious flavor enhancer that is compatible with the paleo autoimmune protocol (AIP). Remove leaves from the woodier stems and place in a small food processor. Pulse or chop until fine. Add garlic and chop until the garlic is so small that it is no longer visible. Add the sea salt and chop until everything is very fine and completely combined. Spread the mixture in a thin layer on a small baking sheet and place in a warm oven (the lowest setting possible - on mine that is 170 degrees F) for 2-3 hours. Check periodically and use a spatula to stir the mixture at least a couple times. The drying process is done when the mixture is noticeably lighter colored and you feel no moisture when you take a pinch of it between your fingers. Use a fork or spatula to break up any larger clumps. Transfer to an airtight container and use to season any savory meat or vegetable dish. Just found this great recipe. Can you use rosemary and sage herbs that come in bottles? Instead of fresh stuff. I think that would work, but you would probably want to shorten up step 4 quite a bit since the herbs are already dry. Do you store this at room temperature? How long does it keep? Yes, just store it at room temperature. I think it should keep indefinitely, but I’ve always used up a jar in a few months because I like it so much!